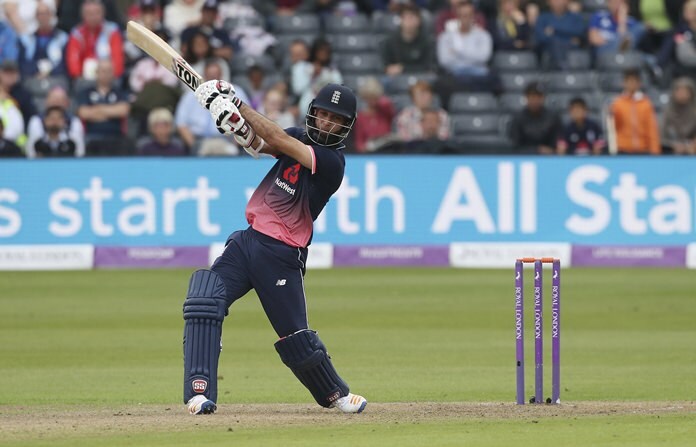 Bristol, England (AP) — Moeen Ali’s staggering century down the order — the fastest on English soil — propelled England to a heavy 124-run victory over West Indies in the third one-day international on Sunday. Ali bludgeoned 102 off 57 balls, with seven fours and eight sixes, to get England to 369-9 batting first, their fifth-highest ODI total. West Indies were all out for 245 in just 39.1 overs, with Chris Gayle’s 94 from 78 balls the tourists’ best response. Liam Plunkett picked up 5-52 for England, who now lead the series 2-0 with two to play. Ali, who arrived with England 210-5 and wobbling at the County Ground, devastated the West Indian bowling with the second fastest ODI century by an Englishman. He went from 50 to 100 in a jaw-dropping 12 deliveries, an ODI record. He raced past 50 and to his century by hitting eight sixes and two fours in the space of 14 balls. Ali smashed 61 runs from those 14 balls. “It was my best ODI innings,” he said. “Everything seemed to come off today and it was nice to get myself in. It was just good to play a few shots. The game had been evenly balanced before Ali’s late-innings onslaught. Joe Root (84) and Ben Stokes (73) put on 132 for the fourth wicket but West Indies pulled it back by dismissing Stokes, Jos Buttler (2) and Root for just 11 runs to have England on 217-6. Ali, who went to 50 off a relatively sedate 41 balls, completely changed the game in the final overs of the innings. He hit back-to-back sixes off Miguel Cummins to go to his half-century, then launched three in a row off West Indies captain Jason Holder next over. After being dropped by Gayle, Ali hit two more sixes in three balls off Cummins again to reach 100. He was dropped twice more before Holder finally held a catch at long-off to end the punishment. Only Buttler has made a faster century for England in ODIs, when he went to three figures off 46 balls against Pakistan in United Arab Emirates in 2015. Gayle did his best to match Ali, with the veteran left-hander clubbing six sixes in his 94. There were a hefty 28 sixes in all during the game, Ali and Gayle accounting for 14 of them. Gayle was run out by a direct hit by Adil Rashid, though, and only Jason Mohammed (38) and Holder (34) got into the 30s after that. Plunkett ended the West Indies innings, picking up Holder for his fifth wicket and his first five-for in ODIs at the age of 32.